Sandy beach at Sebago Lake State Park. Located in Poland just a short drive from Lewiston and Auburn, Range Pond State Park provides an excellent beach for swimming, picnicking, and water sports. The wide, sandy beach gives visitors plenty of room to stretch out and relax. A smooth, surfaced promenade runs parallel to the beach for approximately 1,000 feet, providing easy accessibility to the waterfront. Consider renting a small boat, canoe, kayak, or windsurf board to play in the water. The park offers picnic areas, a group shelter, and a playground. Entrance fees to Range Pond State Park are $4.50 for residents and $6.50 for non-residents; call 207-998-4104 for more information. Rangeley Lake State Park in western Maine provides a swimming area on the shore of Rangeley Lake with spectacular views of Saddleback Mountain. The park campground features 50 campsites, many of which are located near the lakeshore. Fishing is a popular activity, given the large populations of salmon and trout in the lake. Hot showers are available for swimmers and campers to clean off. The park also offers picnic areas and a playground for children. Rangeley Lake State Park is open from May through October and costs $3 for residents and $4.50 for non-residents. Call 207-864-3858 for more information. Mt. Blue State Park, located near Weld, is Maine’s largest state park. The lakeside park features a sandy beach area with amazing views of scenic Mt. Blue. The park offers tent and RV campsites as well as picnic areas, group campsites, showers, and flush toilets. Leashed pets are permitted in the park. The park is staffed from May to October; cost is $4 for residents and $6 for non-residents. Call 207-585-2347 for more information. Founded in 1938, Sebago Lake State Park was one of the first five state parks in Maine. 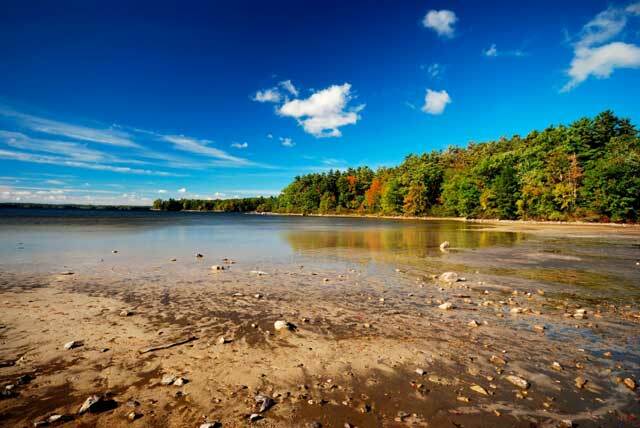 Sebago Lake is the deepest and second largest lake in Maine, filling a granite basin carved by glacier activity. The park features an extensive sandy beach bordered by woodlands. Beachgoers will enjoy views of the White Mountains from the large expanse of smooth sand. The beach area features tables, grills, bathhouses, flush toilets, and hot showers. Lifeguards patrol the beach during the summer months to keep swimmers safe. Sebago Lake State Park also offers 250 campsites, food service, RV hookups, and a trailored boat launch. Entrance fees are $4.50 for residents and $6.50 for non-residents. Call 207-693-6613 for more information.